During the winter I made a sour cherry sauce and of course at the time the only sour cherries that were available with the ones in jars preserved in syrup. I remembered thinking that I had seen some sour cherries at the farmers market during the summer but with so many other things to choose from, they had disappeared before I had gotten the chance to pick some up to try. Last weekend the farmers market was flooded with sweet cherries and to my delight there was even a small offering of sour cherries which I picked up right away! After devouring half of them I quickly got to making a sour cherry sauce using the fresh sour cherries before they all disappeared. I kept the sour cherry sauce recipe pretty simple with just sugar, water and a splash of lemon juice in addition to the cherries. The one thing that I wanted to do was make sure that I got the balance between the sourness of the cherries and the sweetness from the sugar just right as I did not want to completely obliterate the sourness. While initially simmering everything I added the sugar a bit at a time and taste tested as I went until I got it to the point that I wanted. It is probably no surprise, but I have to say that the fresh sour cherry sauce put the preserved version to shame. This sauce is so amazingly good! The sour cherries flavour comes through beautifully hit a hint of the sourness that is mellowed by sweetness. And just look at that amazing shade of red! This sauce would be perfect on some vanilla ice cream, or on plain or vanilla yogurt or even as a syrup on pancakes. I can’t wait to try it out on something and I know exactly what the first thing will be. Bring everything to a boil in a sauce pan and boil for 2 minutes while stirring. Strain the cherries from the liquid, set the cherries aside and simmer the liquid until it thickens, about 2-3 minutes. Remove from heat and mix the cherries back in. I'm so jealous. That sauce takes me back to my childhood. I grew up in Michigan (cherry country!) Let me tell you there is nothing better than sour cherry pie! Ohhhhh. My grandfather had a sour cherry tree and I used to pick them, competing with the birds, in the summer, and then pit them, getting all sticky, and we would make pie and cherry freezer jam. You have brought back some wonderful memories. the color is so bright and pretty! Beautiful vibrant color, I somehow think your first recipe will be oabcakes…right?? ?I'll be back to check it out! I've found sour cherries but they are just so expensive they make you want to cry! The compote looks delicious though…well worth the money so maybe I'll have to pick some up. Such lovely colour!! What are you going to put it on? Looks amazing! I can imagine having this as a snack on toast in late summer afternoons. We have sour cherry trees lining the streets all around my neighborhood in Denver so I'm going to have to grab a bucket full and give this a try. This looks simple and delicious. I'm thinking with crepes, yum! I`ve done this a few days ago, and this is really yummy! I love love LOVE pie made from sour cherries. Never can find them fresh though…my neighbors used to have a tree and offered to let us pick them, after hours of gleeful picking we discovered why they never picked them themselves….every single one was riddled with maggots. Sadness. Now I only buy them jarred…fresh would be so amazing. This sauce sounds wonderful! My grandma used to make this kind of sauce. I will use this for sure! Thank you! 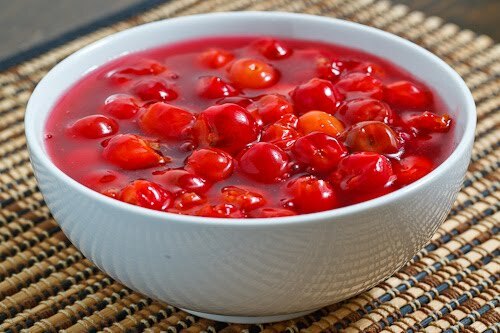 I love sour cherries and this compote looks soooo delicious!!! It would be tasty with almond cake or just spread on freshly baked challah…yum! how to make it as sweet as we get a cherry from a shop. sahir: I am not sure what you are asking but if you mean that you only have access to sour cherries and want a sweeter cherry compote, you can just add more sugar to the sauce.